The Keysight 8494B / 8496B / 11716A is available to buy refurbished used or rent, usually from our UK stock. Click here to download the Keysight 8494B / 8496B / 11716A datasheet. The Agilent 8494B is a manual 0-11dB attenuator in 1dB steps, covering the frequency range of DC to 18GHz. The Agilent 8496B is a manual 0-110dB attenuator in 10dB steps, covering the frequency range of DC to 18GHz. The HP 8494/95/96/97 family of step attenuators offer fast, precise signal level control in three frequency ranges, dc to 4 GHz , dc to 18 GHz and dc to 26.5 GHz They feature exceptional repeatability and reliability in a wide range of frequency, attenuation and connector options. Attenuation repeatability is specified to be less than 0.03 dB (0.05 dB , 18-26.5 GHz) for 5 million cycles per section. This assures low measurement uncertainty and high user confidence when designed into automatic test systems. Electromechanical step attenuators offer low SWR, low insertion loss and high accuracy required by high-performance test and measurement equipment. Precision plated leaf-spring contacts remove attenuator sections (miniature tantalum nitride thin-film T-pads on sapphire and alumina substrates) from the signal path. Unique process controls and material selection ensure unmatched life and contact repeatability. Miniature drive solenoids in the programmable models keep switching time, including settling, down to less than 20 milliseconds. Once switched, strong permanent magnets hold the solenoids (and attenuation value) in place. Current interrupts automatically disconnect solenoid current, simplifying driver circuit design and minimizing heat dissipation. Programming is done through a 12 -pin Viking socket or optional ribbon cables with DIP plugs. With an HP 11713A attenuator driver, 87130A attenuator driver, or an HP 70611A driver for MMS-based systems, automatic drive control is easy using the Hewlett-Packard Interface Bus (HP-IB) automated system. Quickly and conveniently connect 1 dB step and 10 dB step attenuators together to achieve greater dynamic range with 1 dB steps. The 11716 A/B /C interconnect kits contain a rigid RF cable, mounting bracket, and necessary hardware to connect any pair of HP 8494/95/96/97 attenuators in series. 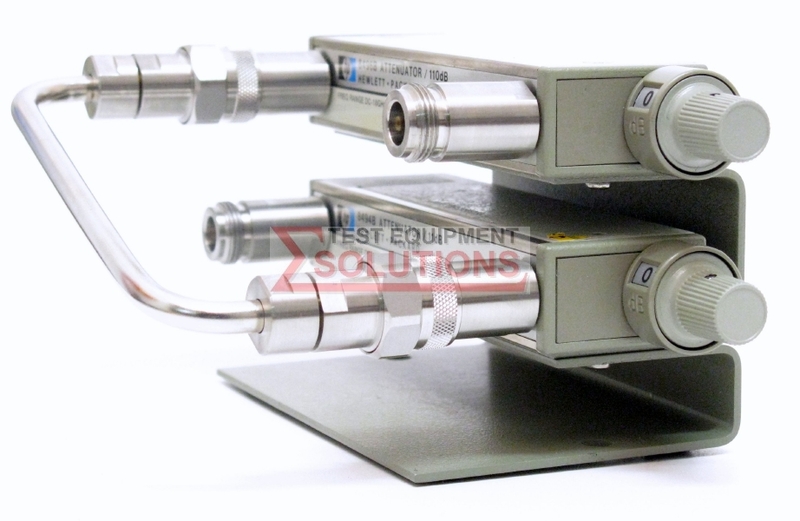 We offer the refurbished used Keysight (Agilent) 8494B / 8496B / 11716A / 001 18GHz Step Attenuator Set 110dB (N-Type) for sale and rental. The Keysight 8494B / 8496B / 11716A is fully tested and refurbished in our in-house ISO9001 calibration laboratory. We supply manuals, accessories, full warranty and a free-of-charge Certificate of Conformity. We can also provide the Keysight 8494B / 8496B / 11716A with a fresh calibration for a small additional charge. If you have under-utilised test equipment talk to us about trading-in or part-exchanging it towards the Keysight 8494B / 8496B / 11716A or other refurbished test equipment.